This is a very dark and twisted tale of how your past may eventually catch up with you and that a life lived in denial is not a life at all. We meet Cecelia Wilborg as she discontentedly reflects over her apparently perfect life in the small picturesque Norwegian town of Sanderfjord. It’s October and waking up in darkness makes her feel low. She revels in her social position within Sanderfjord (as her job as an interior stylist gives her access to the town’s large supply of ‘rich, bored wives’ who are her customers). But there’s something nagging at her, rippling the surface of the life that she fought to achieve, something that she left behind. When she collects her young daughters, Hermine and Nicoline from the local after school swim club she notices a small boy, alone. Patiently waiting to be collected. The receptionist is obviously concerned and asks Cecilia if she’ll drop the boy off at the address that he’s given her (as it’s on her way). Irritated, Cecilia agrees and takes him to the house. But after pushing open the unlocked front door, she finds that nobody’s home. Someone has been living there and Cecilia has the impression of a ‘hollow empty space’ that may have been used by squatters. She makes the decision to take the boy home with her for the night and unknowingly, or perhaps knowingly, she begins the process that will unravel her life. The boy’s name is Tobias, aged 8, and all he has with him is what he’s wearing and a pair of Batman swimming trunks and a frayed blue towel. He stays the night and in the morning Cecilia drops him off at his school. Then social services come calling as he’s told the school that he lives with Cecilia’s family and they want to know more. They allow him to stay for a few more nights while they locate a suitable foster family and then, as they prepare to look more seriously for one, Cecilia makes a confession. This leads to the book’s big twist which is, in many ways, as shocking as that in Gone Girl. It’s difficult to say too much without revealing all but Cecilia made a decision years earlier which had ramifications for everyone in her family. Then in town are two junkies, Anni and Krsyz, who are linked to Tobias, or are they? The narrative is told from three viewpoints; Cecilia, Tobias and Anni, and the reader increasingly questions the reliability of their recollections and actions. 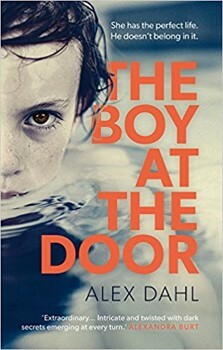 This is a debut novel from Alex Dahl, of considerable power; but it is dark and the bleakness encapsulates the reader like a more mature work. Alex Dahl is writer to watch.